WMA stands for Windows Media Audio, which is an audio data compression format developed by Microsoft - the maker of Windows Media Player. 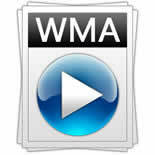 WMA, short for Windows Media Audio, was developed by Microsoft, the maker of Windows Media Player. It is an audio data compression format. WMA files can be of any size compressed in order to match many different connection speeds, or bandwidths. It can work under both Windows and Mac operating systems. It was initially a competitor to the MP3 format. Latterly, Apple introduced iTunes Music Store. WMA became a competitor to that Advanced Audio Coding format used by Apple. Compared with MP3, WMA is maybe not so popular, but as it can compress files at a higher rate, and supported by variable players and jukeboxes, including Winamp, Sonique, MusicMatch and J. River's Media Jukebox. WMA is one of the most popular and familiar audio format now. In the present market, there are many hardware devices supporting WMA, including the hardware and online services PlayForSure devices with Microsoft certification, and a large amount of hardware without Microsoft certification. Most of these devices are portable media players, portable MP3 players, as well as consumer electronics such as DVD players, home entertainment equipments, in-car entertainment systems and cell phones. Additionally, PlayStation Portable V2.60 or higher supports audio files in WMA audio as well. WMA consists of four distinct codecs: WMA, WMA Pro, WMA Lossless, and WMA Voice. The original WMA codec is simply short for WMA, and it is generally regarded as a competitor to the MP3 format and RealAudio codecs. To put it simple, the term WMA which is widely used refers to the format used by media software players, and various compatible hardware devices such as media/MP3 players. It has become one of the most popular audio formats today. Apart from Window Media Player, WMA files can be played back on RealPlayer, ALLPlayer, Winamp, Zune Software, MPlayer, VLC media player.